Every April, my school has a huge carnival fundraiser, complete with food trucks, dunk tank, cake walk, games, face painting, and lots of silent auction items. This year, the PTA asked each class to create a piece of art to be auctioned off, and we could choose to make anything we wanted. Of course I chose to use fabric. Was there ever really a question? I went through my scrap jars and found all of the smallest bits, and decided to make a Ticker Tape "quilt" on canvas using this tutorial from Crazy Mom Quilts. I LOVE it so much, I think I'm going to try to win it for my sewing room...although my assistant principal has her eye on it for her office. The biggest change I made from the method in the tutorial is that I added two coats of glossy decoupage medium on top of the fabric as well, rather than just sticking the fabric down with it. I didn't want to take any chances with the fabric edges fraying, and I like the texture it gives. The kids had so much fun placing the pieces (with a little guidance from me), and I think it will do well at the auction. The canvas is big, measuring 24 x 36 inches, so this is a real statement piece. Even if I don't win it, I think I might have to make another one for myself! Very cool idea! Looks great! I love Sunday Morning Quilts too - am still building up a big enough stash of scraps before I can make anything out of it though LOL! It's great! I would want to win it too! Wow, amazing!! I bet your students had a blast putting this together ... What a great idea! So cool! As a former teacher myself, I'm curius - how exactly did you go about having your kids help you make this? 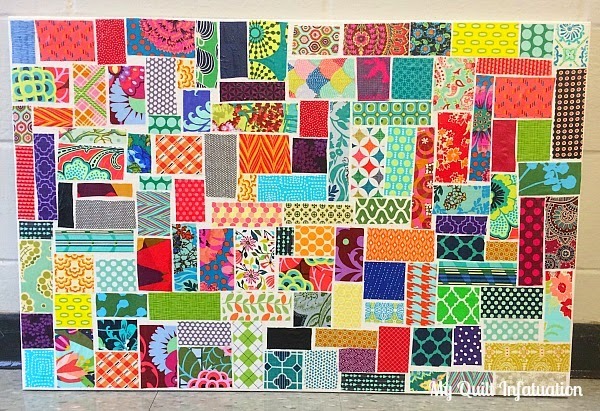 This would kind of be a neat way to reminisce on quilts that you've done in the past, especially if they were special ones for certain people. Hope you get it! I love it! I was just thinking about using some of my fat quarters to put on canvas (Yes, the whole fat quarter) for instant pictures around my house. Some of the fabrics I have just cannot be cut into...this way I can keep them forever! I love this idea, Claudia, may I emulate you and perhaps wind up with my fave fabrics on the walls too ?~! Yowza!! I love how vivid and alive it is... A piece of art indeed!! I'm sure it'll raise big bucks for your event! Please, let us know how it does! What a great art piece for your auction and a good way to involve the kids too.